Moving to a new office, implementing audio/visual capability, or setting up a data center all have one important thing in common: a need for reliable cabling and wireless installation (also called infrastructure wiring). We offer cabling services for the “backbone” and everything inside of your office space. The backbone is the vertical cable that extends your voice and data network to multiple floors or interconnects offices in multiple buildings. When we are working on the backbone wiring, we ensure optimal performance by protecting the cable against potential damage and sources of interference. We also make sure we route the cable and adjust for the cable’s weight so to that the infrastructure is secure. Our in-office wiring systems provide consistently high-bandwidth and error-free performance. 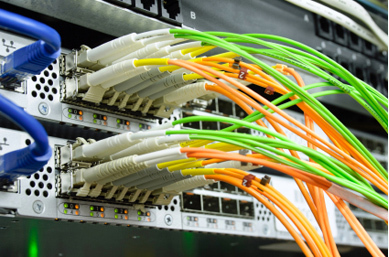 We install all the cabling, connectors, and accessories at a central location for your data network and phone equipment, then use vertical and horizontal cable runs from that location to reach individual desktops. Cabling services involve more than simply attaching cables. Our technicians are always up-to-date on the latest cabling and wireless products from the leading vendors – and are experts at minimizing disruption during installations and service calls. When you work with Bailey Systems, you will get a team that designs logical implementation plans and experienced installers to implement your plan efficiently.